Born in USA, Found in USA. Cut in USA. Longer Lasting- Longer than traditional rawhide chews, bully sticks, ears, etc. More clearly defined shape/size - Our "SPLIT" Antlers are made SINGLE SPLIT or DOUBLE SPLIT for more proper sizing choice. 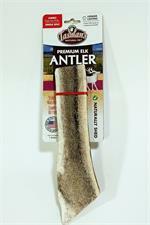 ALL of our Small and Medium Split, and most of our Large Split antlers are made this way, to be more gentle on smaller and older dog’s teeth. We recommend our Large double split for larger older dogs. Note – For older, larger dogs, we recommend our Large Double Split or possibly XL Single Split. 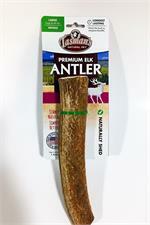 We offer whole antlers in all 5 sizes – Small, medium Large, Extra large and Jumbo. * Our recommended Antler Sizing Chart is a Guideline, as every dog is different, with differing chewing habits, differing tooth health, etc. Please consult your Veterinarian if you are unsure of which size or are concerned whether Antlers chews are right for your furkid(s). Supervise your dog When giving them an Antler Chew! Limit Chew time to 30 – 60 minutes or so per day. 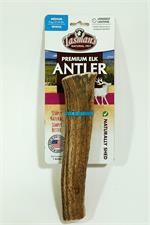 Choose appropriate size antler for your dog. . 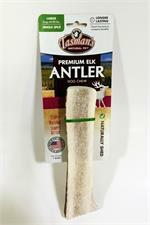 Remove and discard when antler becomes small enough to be a choking hazard. 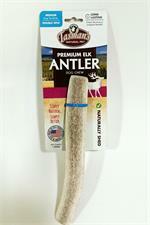 Check antler for any splintering, remove if broken or splintered. Know your dog. Antlers may not be suitable for food protective dogs or gulpers. Wash your hands after handling Chewed antler. Inspect previously chewed Antler before giving back to your dog. If Sharp edges are present, sand them down before resuming the teeth cleaning fun.